Touch the Widgets category atop the Apps screen. Or you can just scroll the list of apps to the left until Widgets is displayed. The widgets appear on the Apps screen in little preview windows. Some widgets, such as the Contact widgets, are icon-sized. Others are quite large. That’s okay because you can resize widgets. Long-press the widget and drag it to a Home screen panel. Position the widget on the Home screen, dragging it left or right to another page if necessary. Release your finger to plop down the widget. (Optional) Resize the widget by dragging one of its edges in or out. Some widgets can change their size, some cannot. To find out which, long-press the widget. If the widget can be resized, you’ll see four dots on its edges. (Lift your finger after long-pressing the widget.) The dots are handles, which you can drag using your finger to resize the widget. Touch anywhere on the Home screen when you’re done resizing a widget. The variety of available widgets depends on the applications you have installed. Some applications come with widgets; some don’t. Some widgets come independently of any application. 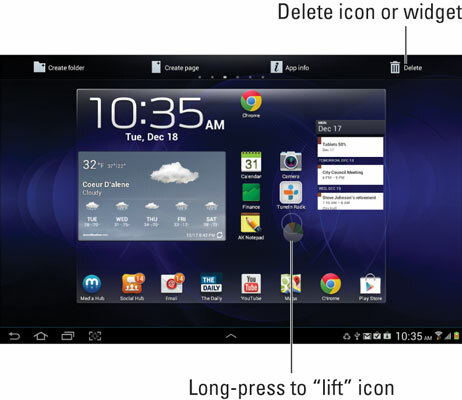 There must be room for the widget or the tablet won’t let you plop it down. Choose another page or remove icons or widgets to make room. Icons and widgets are fastened to the Home screen by something akin to the same glue they use on sticky notes. You can easily pick up an icon or a widget, move it around, and then restick it. Unlike sticky notes, the icons and widgets never just fall off. You can drag a free icon to another position on the Home screen or to another Home screen panel, or you can drag it to the Trash icon that appears on the Home screen. That icon may look like a trash can or may simply be a large X.
Dragging a Home screen icon or widget to the trash ousts that icon or widget from the Home screen. It doesn’t uninstall the app or widget, which is still found on the Apps screen. In fact, you can always add the icon or widget to the Home screen again. When an icon, a widget, or a folder hovers over the Trash icon, ready to be deleted, its color changes to red. Your clue that an icon or a widget is free and clear to navigate is that the Trash icon appears.